This month, Yale University Press publishes The Mortgage of the Past: Reshaping the Ancient Political Inheritance (1o50–1300), by Francis Oakley, President Emeritus of Williams College. The volume is part of a three part series on the emergence of a secular from a religious socio-political worldview during the Middle Ages. 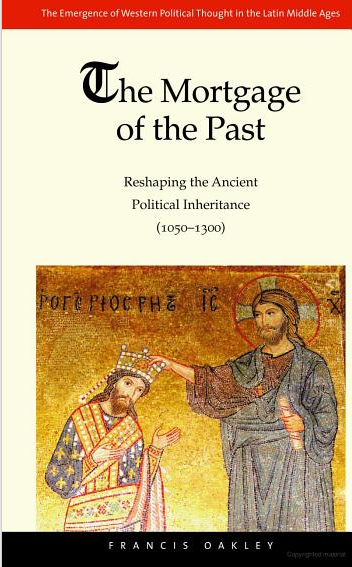 In this book, Oakley explores the confluence of secular and religious forces in the Middle Ages that shaped the transformation from a political conception of (1) a divine procession from king to heir to (2) a more secular understanding of the procession from ruler to ruler. Please follow the jump for the publisher’s description. Francis Oakley continues his magisterial three-part history of the emergence of Western political thought during the Middle Ages with this second volume in the series. Here, Oakley explores kingship from the tenth century to the beginning of the fourteenth, showing how, under the stresses of religious and cultural development, kingship became an inceasingly secular institution.